Casanova Grand Ball, Vices & Virtues Saturday March 1st 2014, Palazzo Cà Zen, Venice. After the great success of our event ” Venice, the Sea’s bride” held during carnival 2013, Atelier Marega is glad to introduce you , the Casanova Ball, titled “Casanova Grand Ball, Vices & Virtues ” . The theme chosen for this spectacular event is the rediscovery of Casanova’s human unconscious through his Vices and Virtues that have accompanied and pleasantly damned, the bubbly and the funny life of this famous Venetian character, connoisseur and lover of feminine charm. Himself , as Venitian tradition said, was born from an extramarital affair of Casanova’s mother with the noble Michele Grimani . The Casanova Grand Ball, will take place on March 1st 2014 in the beautiful Palazzo Cà Zen , located in Venice, close to the famous Frari Church. At 8:00 p.m. in Palazzo Zen’s courtyard , the Welcome cocktail will start. Our guests will be entertained by the fantastic performances of our several artists . It will be the beginning of a wonderful walk along the eye-catching way of Casanova …. At 9:00 p.m. in the main room at the noble floor, will start the Gala Dinner . Typical dishes of the Venetian delicacies will be served. ( menus for allergies should have requested at booking time ) . During the Gala Dinner , our artists will fascinate and delight our guest with great performances. Fortune tellers, exotic dancers , the mysterious shadows’ theater …. are some of the surprises waiting for our guest …. At 11:30 p.m. in the Palazzo Zen’s disco , will start the Masquerade Grand Ball. Our guest will dance to the rhythms expertly mixed by the great Dj Andrea . All the guests will find some relax time in the lounge area . The open bar will offer them fresh fruit and alcohol drinks and hot drinks accompanied by the sweet delicacies Venetian … frittolle and Galani . 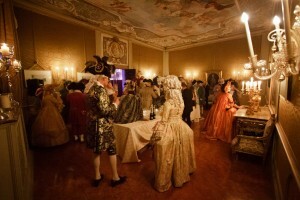 “Casanova Grand Ball , Vices and Virtues” March 1, 2014 , Palazzo Cà Zen ( San Polo 2580 , Venice) . -Entrance to the Palazzo Cà Zen at 11:30 p.m.
For guests Full Ticket holders , Palazzo Zen’doors will be open at 8:00 p.m.
For guests After Dinner Ticket holders , Palazzo Zen’doors will be open from 11.30 p.m.
After dinner ticket holders, from 11,30 p.m. to 00:15 a.m. After this time the door will be closed. Chandra Marega mob. ph. 0039 340 56 23 987. Casanova Grand Ball is waiting for you…..